I discovered the Valkee today through a new press release (8/28/12) but it’s been around for some time now [lengthy rather amusing Slashdot thread from Aug. 2011]. Bright light therapy has been shown to be an effective cure for seasonal depression. New Finnish research reveals that bright light therapy, when administered through the ear canal directly to the photosensitive brain tissue, offers benefits for those not suffering from seasonal depression at all, as it improves the cognitive performance and mood of the healthy, too. The new studies are linked to on the Valkee Evidence page. Previous studies have shown Transcranial Bright Light Therapy to be effective in treating Seasonal Depression Disorder (SAD) but in a new study, Finnish hockey players improved their ‘motoric reaction speed’. 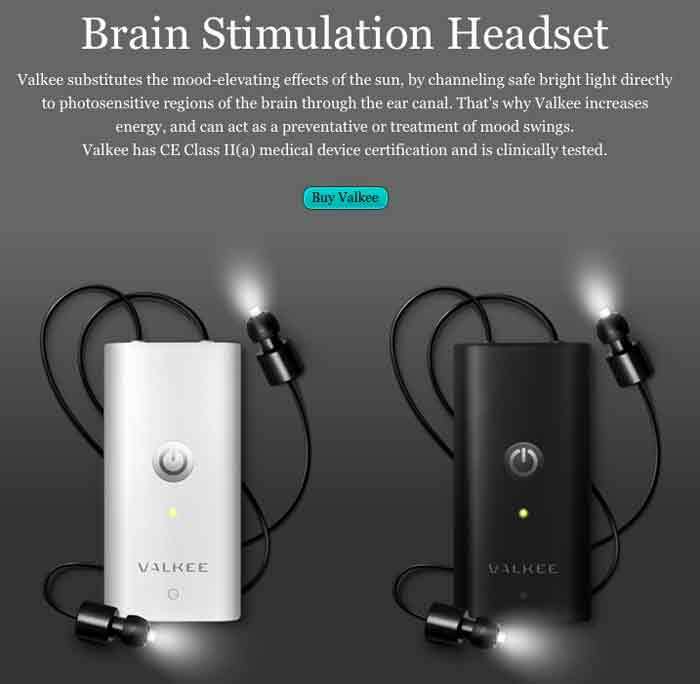 Valkee seems to be targeted towards travelers anticipating jet lag, or those in Northern climates where winter exposure to light is limited. But the Valkee Benefits page mentions everything from PMS to ‘reduced carbohydrate cravings’. “Valkee currently does not ship into the US, but we will soon!” And you can sign up to be notified. Photo links to more Valkee marketing material. Certainly a little perspective is warranted from time to time. Instead, Chi and Snyder’s study suffers from a catalogue of confounding factors and logical flaws. The most important of these is the “Nostradamus” problem: that by failing to control for alternative explanations, their results – like the writings of the famous French prophet – are open to a multitude of possible interpretations. Snyder’s participants solved maths puzzles that the researchers claim required “insight”, yet crucially the subjects did not perform any other tasks to show that only puzzles requiring “insight” were influenced by the brain stimulation. This flaw means that any interpretation of the results is defined chiefly by two words: “maybe” and “or”. Rather than encouraging novel thinking, maybe brain stimulation made participants less cautious in reaching a decision, or maybe it helped them recall a similar problem seen a few minutes earlier, or maybe it made them temporarily less distractible (or even dulled their hearing), or maybe it boosted general alertness (not surprisingly, people tend to do things faster and better when they are more awake). via ‘Thinking caps’ are pseudoscience masquerading as neuroscience | Science | guardian.co.uk. Subjects definitely register the stimulation, but it is not unpleasant. “It feels like a mild tickling or slight burning,” says undergraduate student Lauren Bullard, who was one of the subjects in another study on TDCS and learning reported at the meeting, along with her mentors Jung and Michael Weisend and colleagues of the Mind Research Network in Albuquerque. “Afterward I feel more alert,” she says. But why? 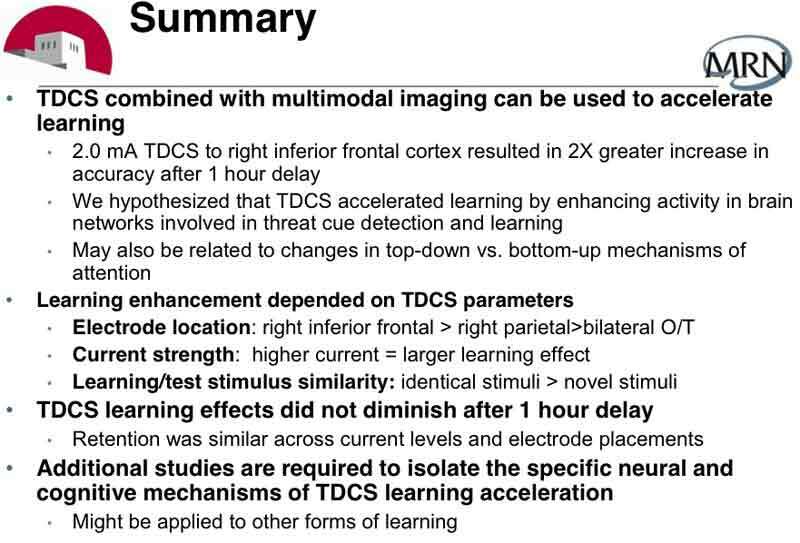 Bullard and her co-authors sought to determine if they could measure any tangible changes in the brain after TDCS, which could explain how the treatment accelerates learning. The researchers looked for both functional changes in the brain (altered brain-wave activity) and physical changes (by examining MRI brain scans) after TDCS. They used magnetoencephalography (MEG) to record magnetic fields (brain waves) produced by sensory stimulation (sound, touch and light, for example), while test subjects received TDCS. The researchers reported that TDCS gave a six-times baseline boost to the amplitude of a brain wave generated in response to stimulating a sensory nerve in the arm. The boost was not seen when mock TDCS was used, which produced a similar sensation on the scalp, but was ineffective in exciting brain tissue. 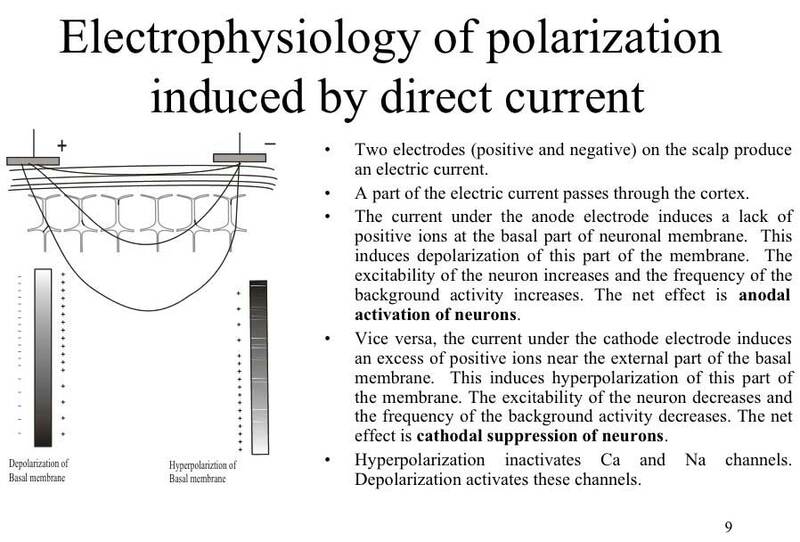 The effect also persisted long after TDCS was stopped. The sensory-evoked brain wave remained 2.5 times greater than normal 50 minutes after TDCS. These results suggest that TDCS increases cerebral cortex excitability, thereby heightening arousal, increasing responses to sensory input, and accelerating information processing in cortical circuits. Remarkably, MRI brain scans revealed clear structural changes in the brain as soon as five days after TDCS. Neurons in the cerebral cortex connect with one another to form circuits via massive bundles of nerve fibers (axons) buried deep below the brain’s surface in “white matter tracts.” The fiber bundles were found to be more robust and more highly organized after TDCS. No changes were seen on the opposite side of the brain that was not stimulated by the scalp electrodes. Anthony channels our inner lab rat on his fascinating YT channel. It doesn’t get any more DIY than this! Towards the end of the video, Anthony explains why he switched to a manufactured device. You can follow Anthony on Twitter @GetLimitless and check out his blog, GetLimitless.com. Alan Snyder is the Australian Dr. often associated with tDCS, TMS and creativity. We met him earlier on the blog. Dr. Snyder seems to be that rare combination of scientist, marketer and cheerleader for change. 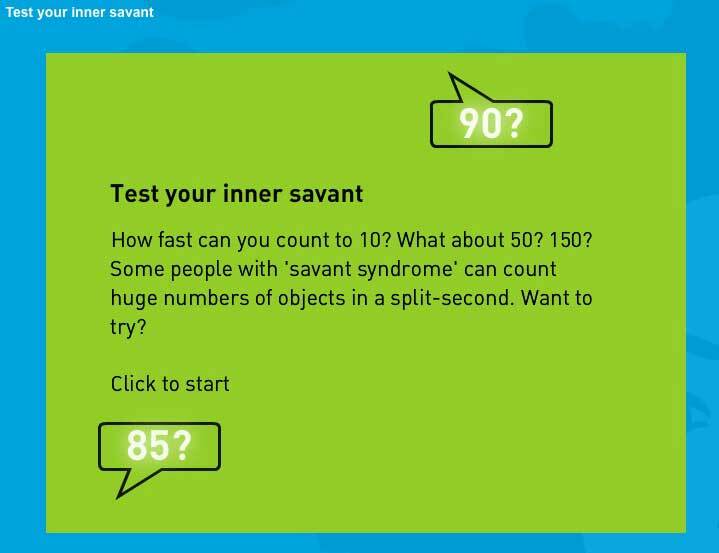 Turns out you can try his ‘Savant Test‘ as shown in this Nat Geo clip. Another significant player popped up today. Juri Kropotov (bio) Institute of the Human Brain of the Russian Academy of Sciences. You can download his 2006 Powerpoint presentation, “Transcranial Direct Current Stimulation (tDCS): a new old tool in neurotherapy” Here. You can see the Google Quick View version (and print it) here. 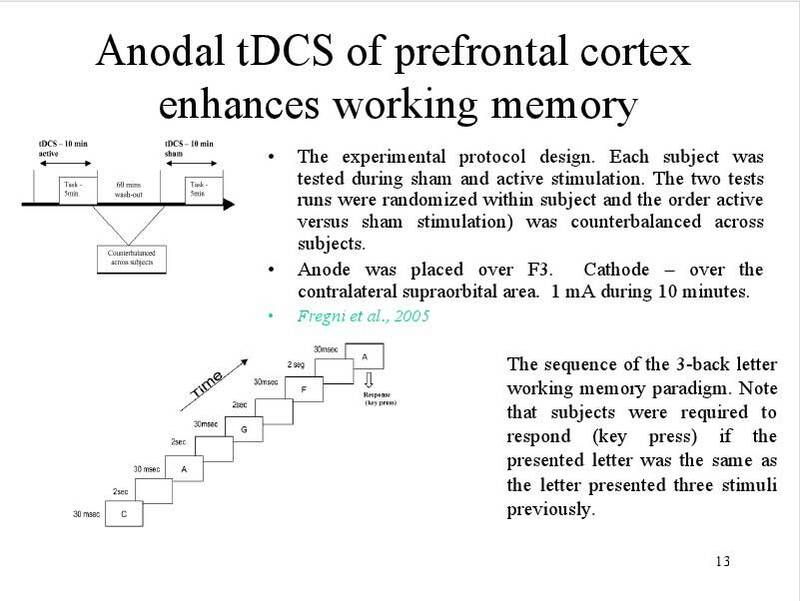 Of special interest may be Kropotov’s use of tDCS in treating ADHD. Recently, several people have called my attention to a very simple and quite old form of neuromodulation that is currently gathering a lot of research momentum—transcranial direct current stimulation (tDCS). Here’s why I’m excited about tDCS. The effects of tDCS seem to map directly to the core themes in mindfulness. 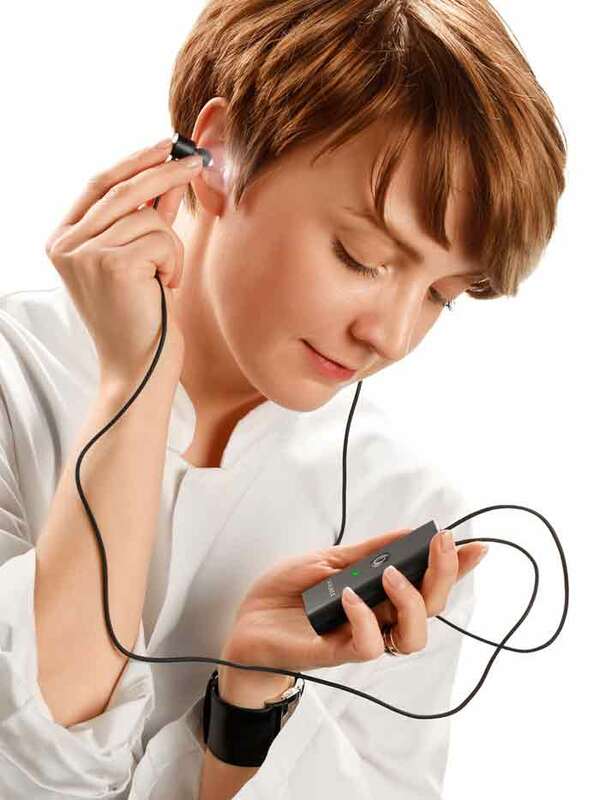 via Shinzen’s Blog: Meet My New Girlfriend: tDCS. Exciting! Reports from self-experimenting starting to come in! In this case the author used the Cambridge Brain Challenge suite of tests to guage the effect of tDCS. Observations The most immediatley obvious and striking effect of tDCS is the modest but significant increase in Paired Associates score during excitatory tDCS. This score, which measures the ability to remember the locations of objects on a screen, likely correlates with overall working memory, which has been previously shown to be improved by exciting the left DLPFC. 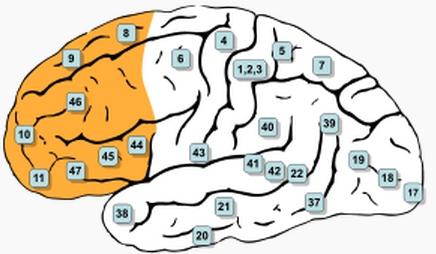 via Effects of inhibiting and exciting the left DLPFC–an experiment : tDCS. This is pretty fascinating. If I’m getting it, it implies that for this particular brain function there is an upward bounded capability. If you’re already there (say, genius level) tDCS won’t improve your performance, but it will if you’re not already wired at the upper bound! I know from my CambridgeBrainScience.com tests, that I’m especially weak in the VSTM (visual short-term memory) area. [Unfortunately there’s a paywall around this and most other journal paper.] Paper originates from the Institute of Cognitive Neuroscience at the National Central University, Taiwan. Here we show that artificially elevating parietal activity via positively charged electric current through the skull can rapidly and effortlessly improve people’s VSTM performance. 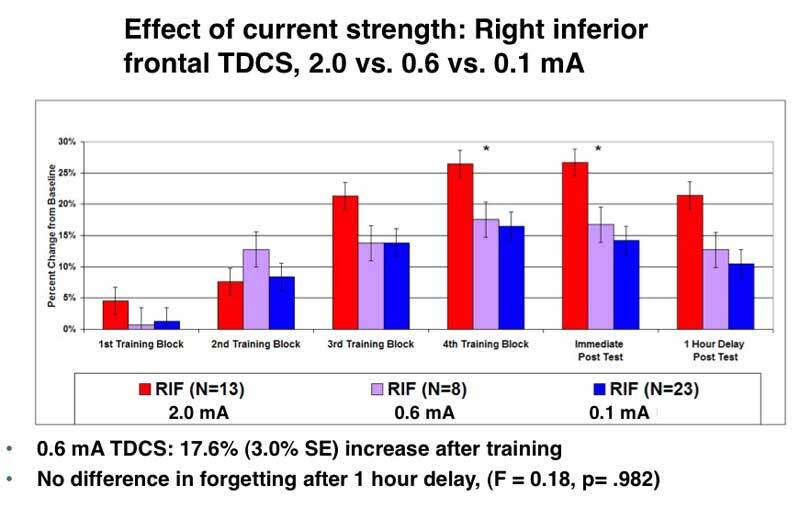 …The high performers, however, did not benefit from tDCS as they showed equally large waveforms in N2pc and CDA, or SPCN (sustained parietal contralateral negativity), before and after the stimulation such that electrical stimulation could not help any further, which also accurately accounts for our behavioral observations. Together, these results suggest that there is indeed a fixed upper limit in VSTM, but the low performers can benefit from neurostimulation to reach that maximum via enhanced comparison processes, and such behavioral improvement can be directly quantified and visualized by the magnitude of its associated electrophysiological waveforms. via Unleashing Potential: Transcranial Direct Current Stimulation over the Right Posterior Parietal Cortex Improves Change Detection in Low-Performing Individuals. “There is evidence that the lateral prefrontal cortex is the brain region that ‘remembers’ (maintains) the goals and instructions that help you keep doing what is needed when you’re working on a task,” Cole says. via Imaging global brain connectivity can predict how intelligent you are | KurzweilAI.